Liverpool legend Steven Gerrard has conceded that his slip against Chelsea in 2014 will stay with him but hopes that the current crop can deliver a title this season. The Reds have stumbled in recent weeks, and as they’ve dropped points it has allowed reigning champions Manchester City to leapfrog them and move a point clear at the top of the Premier League table. 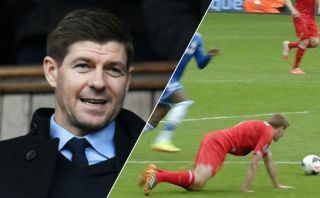 Naturally, thoughts are wandering back to 2014 when Gerrard’s costly slip against Chelsea went on to see Liverpool squander their chance to end their long wait for a league title. The Reds icon has conceded that it’s still an open wound for him given the disappointment that he would have felt with such a big chance to win the title slipping away, but he sensibly tried to alleviate some of the pressure on his former club too with regards to comments on their current title charge. “This wound has been open since my experience. I’m not sure it’ll close because I can’t change that experience,” Gerrard told reporters, as quoted by Sky Sports. “Certain people will see it as failure but that is football and opinions. Jurgen has taken the squad forward giant strides. He’s doing everything he can. Time will tell who ends up on top with just nine games remaining, but there are undoubtedly going to be more thrills and spills in the coming weeks with both title challengers under pressure to continue to win across multiple fronts.